The demonstration of a new US system to get astronauts into orbit is under way. The SpaceX company has launched a capsule designed to carry people from the Kennedy Space Center in Florida. The mission is uncrewed for this flight, but if it goes well, the American space agency is likely to approve the system for regular astronaut use from later this year. SpaceX founder Elon Musk said this could be the first step towards opening space travel to commercial customers. Not since the retirement of the shuttles in 2011 has the US been able to put humans in orbit. It has been paying to use Russian Soyuz vehicles instead. SpaceX’s Falcon 9 rocket and Dragon crew capsule lifted off from Kennedy’s historic Pad 39A at the precise planned time of 02:49 EST (07:49 GMT). 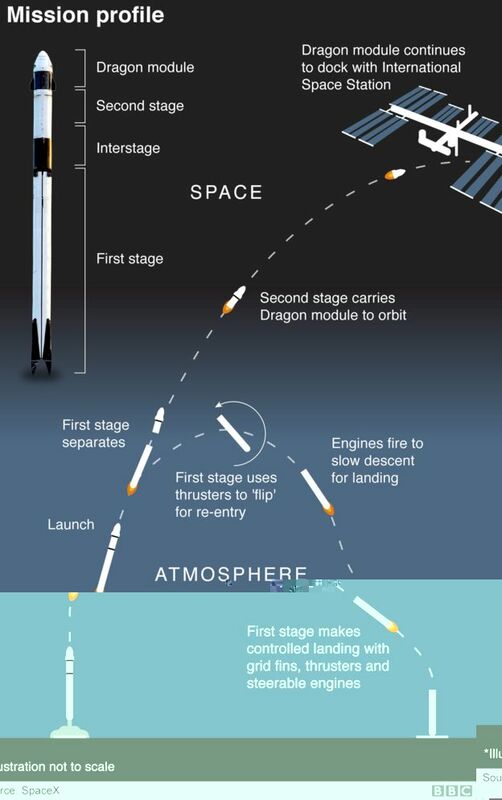 The 11-minute ascent put the Dragon on a path to rendezvous with the International Space Station (ISS) on Sunday. Who is this character Ripley? Because this is just a demonstration, there are no astronauts aboard – but there is a “test dummy”. Dressed in a spacesuit and sitting next to a window, this anthropomorphic simulator is fitted with sensors around the head, neck, and spine. It will gather data on the type of forces that humans will experience when they get to ride in the spacecraft. For the California company, this mission is a key milestone in its short history. Mr Musk, a technology entrepreneur and engineer, set up the organisation with the specific intention of taking people into space. “It’s been 17 years to get to this point, from 2002 to now. To be frank, I’m a little emotionally exhausted because it was super stressful,” he told reporters immediately after the launch. Mr Musk said those customers could include private citizens going to the ISS, just as they have done on Soyuz vehicles in the past. The Dragon crew capsule is a variant on the ISS cargo freighter flown by SpaceX. Upgrades include life-support systems, obviously; and more powerful thrusters to push the vessel to safety if something goes wrong with a rocket during an ascent to orbit. It also has four parachutes instead of the freighter’s three to control the return to Earth. How has Nasa changed since the shuttle? Nasa is essentially now contracting out crew transport to SpaceX. Whereas in the past, Nasa engineers would have top-down control of all aspects of vehicle design and the agency would own and operate the hardware – the relationship with industry has been put on a completely new footing. Today, Nasa sets broad requirements and industry is given plenty of latitude in how it meets those demands. Agency officials still check off every step, but the approach is regarded as more efficient and less costly. Nasa chief, Jim Bridenstine, stressed on Saturday that the re-introduction of American crew transport did not mean an end to cooperation with Russia. “We want to make sure that we keep our partnership with Russia which has been very strong for a long period of time, going all the way back to the Apollo-Soyuz era,” he said. How should this mission play out? After being taken to orbit, the Dragon makes its own way to the station using onboard thrusters. One of the big differences between this mission and standard cargo flights is the mode of approach and attachment to the ISS. Freighters come up under the orbiting lab and are grappled by a robotic arm and pulled into a berthing position. On this occasion, we will see the crew version of Dragon approach the station at the bow and dock automatically, using a new design of connection ring. Arrival is set for 11:00 GMT on Sunday. ISS astronauts will be watching closely to see that the capsule behaves as it should. The Dragon is expected to stay at the station until Friday. The current plan has it undocking, firing its thrusters to come out of orbit, and splashing down at roughly 13:45 GMT. Kirk Shireman, the manager of Nasa’s ISS programme, said: “You’ll hear us talk about this being a flight test; it absolutely is, although we view it also as a real mission, a very critical mission. Nasa is also working with Boeing on crew transport. The company has developed a capsule of its own called the Starliner. This will have its equivalent demo flight in the next couple of months.